Bastion is one of a kind, kid. Seriously, it’s a game of it’s own creation. 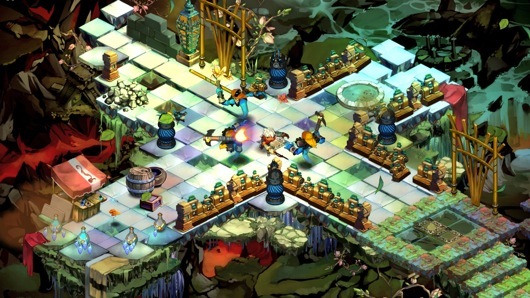 I have never played a game like this; Bastion is the beginning of a new set style of games, at least I hope. This game takes the basic gameplay mechanic of Hack/Slash and the RPG genre and blends it in with a few added tweaks. Land that emerges at your feet, everything you do is narrated, and there is a great amount of customizations. Now this is what a game should always turn out to be when it’s released, breathtaking and amazing! Bastion centers you around the main character known only as “The Kid” and you’re set out to go to the Bastion. The Bastion is a safe haven for survivors of the calamity, and the calamity is what has happened to the world when you are playing it. Now once you complete a few objectives, you end up at the Bastion and this is where the game truly begins. You are set out to gather crystals that will help power up the Bastion. The crystals will affect the Bastion to either fix everything within it or leave it as it was; that’s why you are set out to get them. There are a total of 6 crystals, when each crystal is collected you can open up a store. The stores range from a Weapon Upgrade shop all the way to a Wine & Spirits shop. All these stores are so unique in themselves. For instance, the Wine & Spirits shop is where you go to add an ability every time you level up (total of 10 levels). Each level opens up a slot where you can put a “spirit” that makes your characters better – Ex: Max Health increased by 10. I’m not even touching the surface here with all the stores and what everything does, this is something you would just need to find out while playing. Another great thing about this game is that when you collect a new weapon (there are a total of 11 weapons, mixed with melee and ranged) you unlock a proving ground area, this is where the game throws a challenge at you with that weapon. It’s a lot of fun too. Bastion’s story is very odd in that you honestly don’t know much of anything. You get small bits of the story here and there, but you really never truly know 100%. That’s what makes the game for me though; it’s mysteriousness. Plus it’s just an all around amazing looking game. Some of the enemies are so cool looking however some are very bland. My biggest problem was at the end of Bastion, you get prompted to make a choice (two times I might add) and each with its own outcome. It was cool to have that in the game, but at the same time I wish they did that throughout the game more often then at the last minute. Oh no, you beat the game. Game over. NO! Bastion features a “New Game Plus” so that when you beat it, you can go back with everything you got and upgraded in your first play-through. Plus, you go all the way to level 10 this way. The second time you play, I felt was way more fun too. Man, I really just hope whoever reads this review goes out to buy this game. It’s a must own and I don’t want to say much more because it’s a great experience. Anyways, Bastion is game of the year of Arcade games in my book, hands down. Bastion is, hopefully, the beginning of so much more. When I finished this game my second time around, I was in shock. I wanted more of everything and did not want my adventure to be done. I do think there’s something here for a possible series, but we will have to wait and see now won’t we, kid.